Up front we see a main power button plus input level controls for each pair of amplifiers. There are also bridged mono and power indicators to show the mode of operation. Around the back are three pairs of phono terminals (input) and 4mm banana sockets (output). You also have three groups of switches that determine how the amplification is configured: choose 6 x channel operation or linked or bridged output. The linked mode allows the stereo input for one amplifier pair to be shared with either (or both) of the other pairs. For example, in this mode, the rear feed from a Pro-Logic or Dolby Digital preamp could drive an array of six speakers – three on each wall – of a very large home cinema. 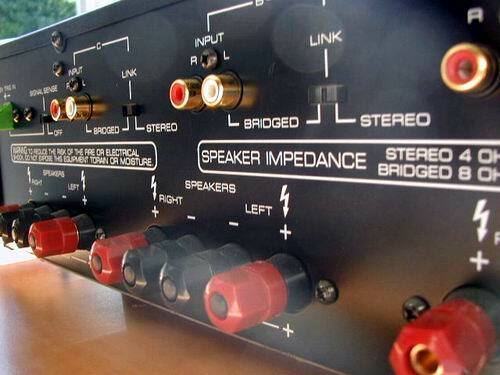 The bridged mode allows a pair of amplifiers to become a high-power (150W quoted) mono amp. It requires different wiring. 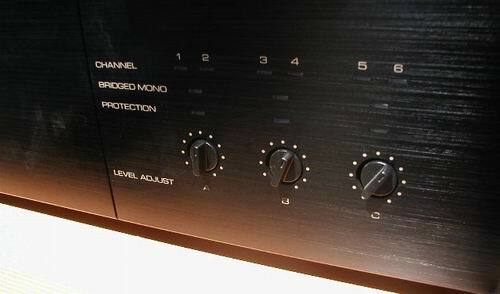 Instead of connecting your speaker to the regular plus and minus terminals, you 'bridge' (hence the term) across the two positive outputs of a stereo pair. The link switch also needs to be engaged. In this mode, the right-hand input terminal is unused (the input being fed to the left terminal). Given the low cost I couldn't resist a peek inside. The core of this amplifier is occupied by a single torroidial transformer that supplies all channels. The construction quality is fair. If amplifiers were restaurants, this Rotel would be a fast food joint – inexpensive but able to fill your belly when it rumbles. But like other cut-price multi-channel power amps, it's not at its best in pure stereo mode. Here, I found the sound quality bland. My test CDs (Beethoven's 5th – Karajan – and Grieg Piano Concerto – Katin) plodded along without real depth or warmth. It makes a sound, yet lacks soul. Pro-Logic programmes fared slightly better. The skull crush in T2 was bright and brittle – but loud. Vocals from Linda Hamilton were not the warm, lush, forward tones heard on the very best power amps. They sounded drier, more clinical. As always, amplifiers are only as good as the source fed to the input. 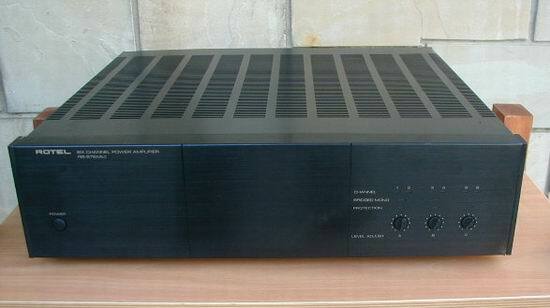 On Dolby Digital laser discs, this amp sounded at its best. There was more sparkle on highs and the low frequency 'slam' was well handled. Surprisingly, 60W into the Jamo sub came up trumps. I was amazed that the Rotel RB976 did not compromise front-to-back separation – even with six channels occupying the same cluttered circuit board. On Spy Hard the three seconds' worth of helicopter noise (on the rear channels only) was delivered with the same discrete separation as the most expensive amplifiers tested. In summary, not a sonic revelation yet excellent value for money. Just like your favourite burger bar, this amp serves sonic sustenance for those starved of separates – and £375 is appetising price. The manufacturer's spec of 60W per channel is only attainable if you can accept high levels of harmonic distortion. A spectrum analysis at the clipping point shows THD beyond 3% – not very nice. 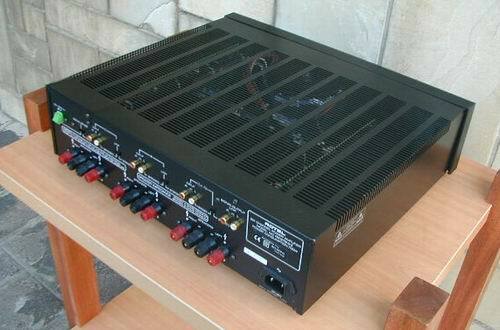 In the real world this amp has a Fidelity Firewall of 48W. Otherwise a clean bill of health with a level frequency response.